This past week was a veritable marathon of Christmas joy. 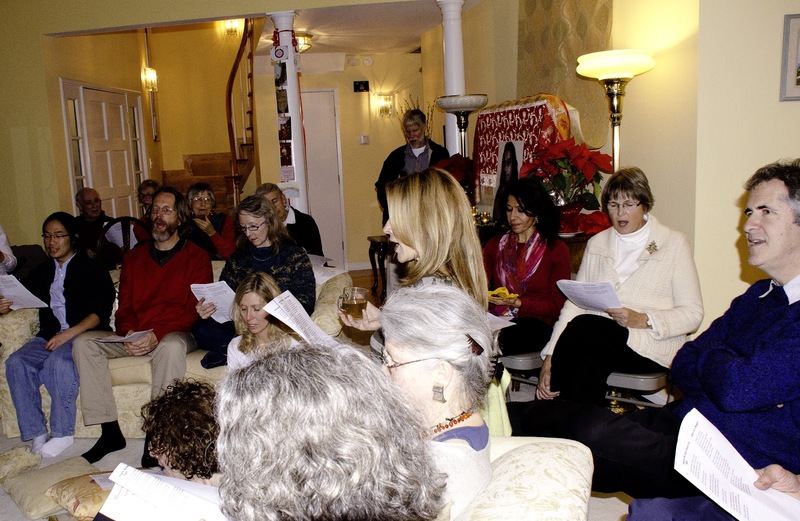 We started on Saturday with our annual all-day meditation, and it seemed especially sweet to have it land so close to Christmas Day itself this year. Those eight hours are a beautiful chance to become more deeply aware of the feeling of Christmastime, and trace it inward and upward back to Jesus and to God. 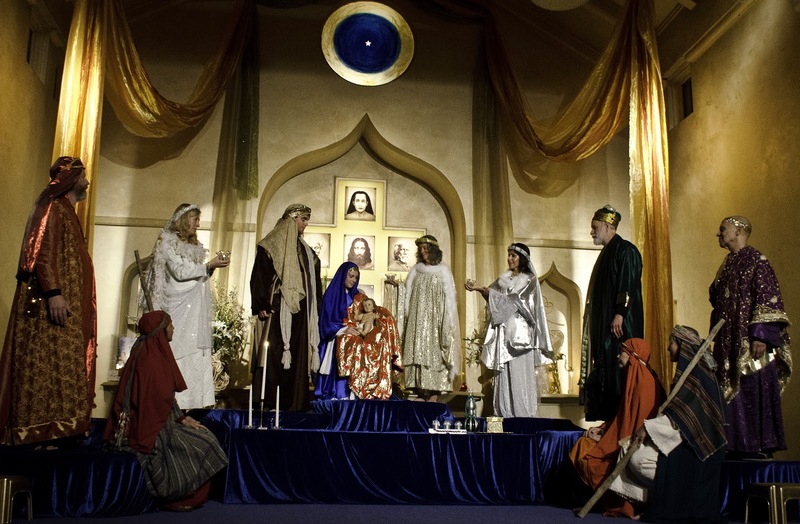 Christmas Day featured an expanded dramatization of the Christmas story, complete with dual-sized kings and angels, and narrated by Rabbi Asha in full storytelling mode. 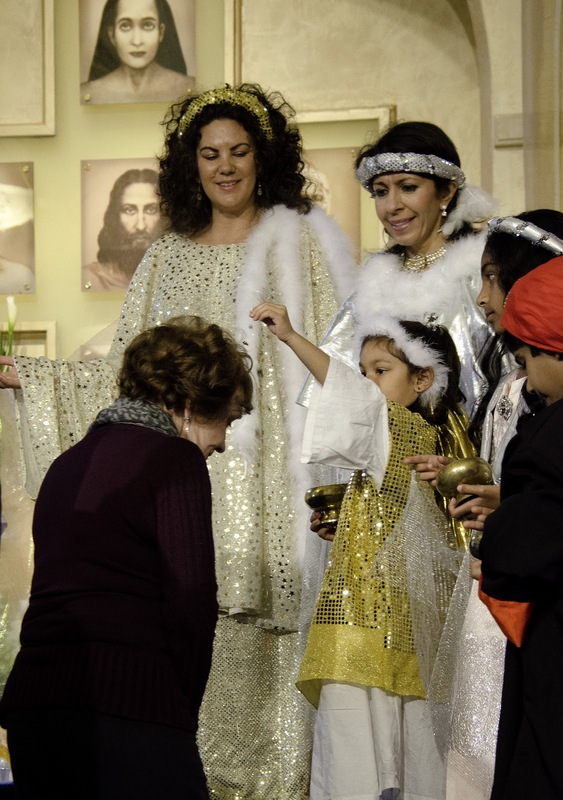 The blessings at the end of the story/service came in two varieties as well: the touch of light and the touch of glitter, administered by the taller and shorter angels, respectively. 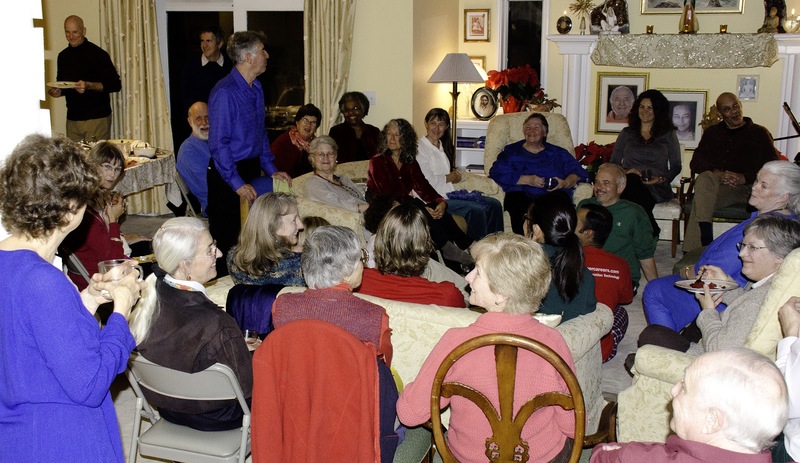 The Christmas banquet entertainment managed to fill a glaring hole in the previous week’s caroling. I refer, of course, to The Twelve Days of Christmas, which were dutifully and enthusiastically enacted by assigned tables of piping pipers, golden rings, and apparently a whole family of partridges in a pear tree. Enjoy the rest of the photos, and may you carry the Christmas bliss with you into the new year! 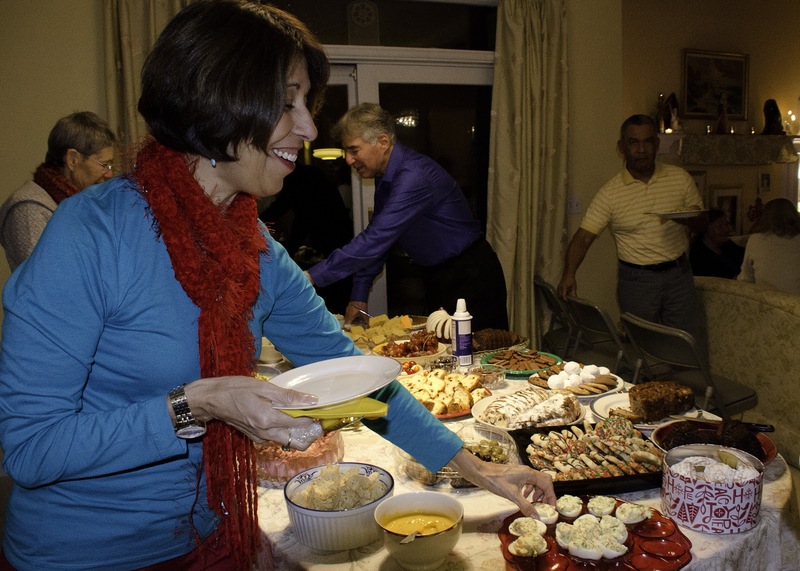 David and Asha hosted several Christmas parties this weekend at Chela Bhavan, their home in the residential community. 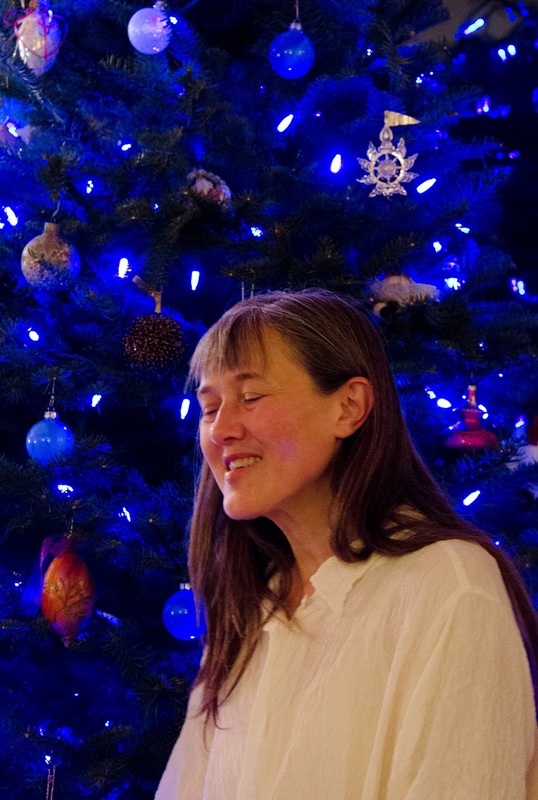 (As an aside, their celestially blue Christmas tree was apparently imported directly from the astral world this season.) The Friday and Saturday parties are “duplicates” so as to be available for as many people’s schedules as possible, though a great many of us just go to both. ’Tis the season, after all, and I do mean for eating. 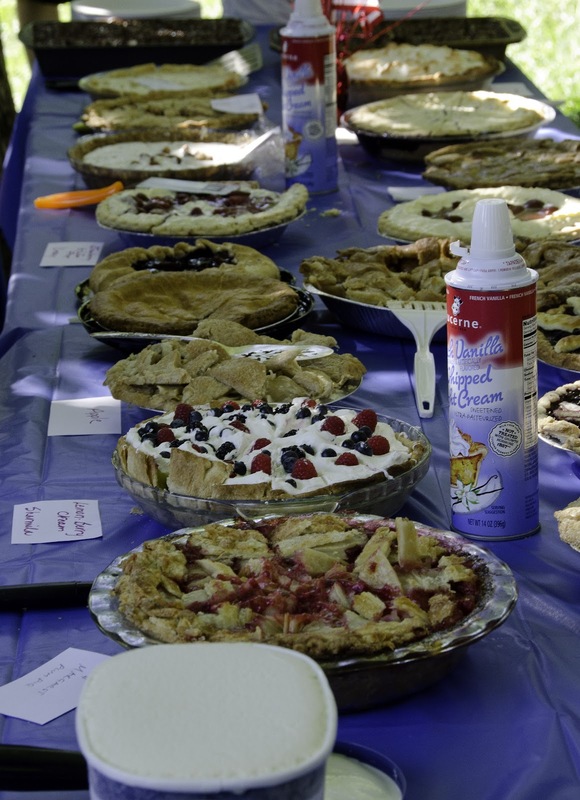 The “sweets and savories” potluck leaned heavily yet delightfully towards the sweet end of the scale, with plenty to stuff all the assembled multitudes. 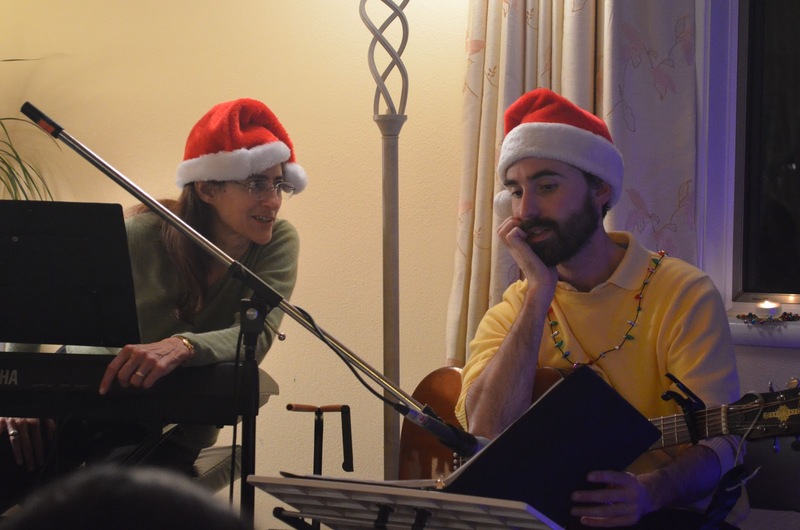 Left: Two santa-musicians trying to figure out a tricky bit of music. 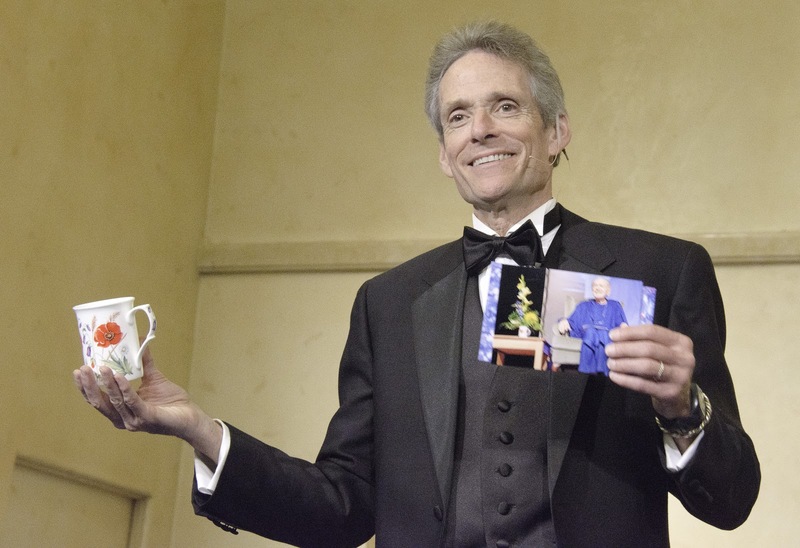 Right: Singers doing just fine, regardless. So that was Friday and Saturday. The party on Sunday was completely and utterly different. That night we sang first, and then ate. 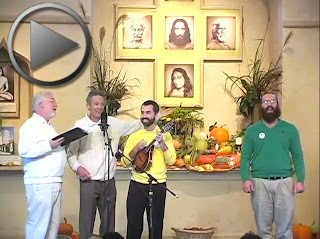 And actually, we sang all around the neighborhood, so that bit was different, too. 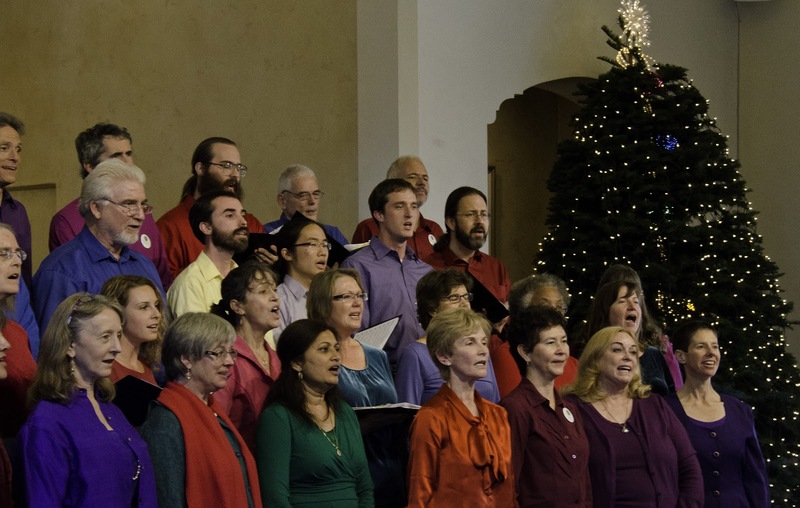 It was a surprisingly warm night, perfect for caroling and bringing a little extra music and joy to all our neighbors. 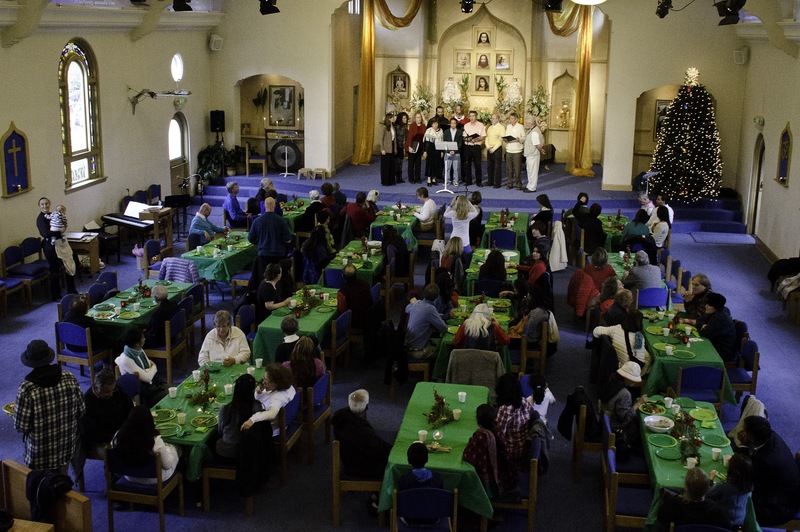 Highlights included launching carols at kids in an upstairs window while their parents were busy watching the football game, being joined in “Good King Wenceslas” by a residential trumpet player, and a final song at Master’s shrine that left everybody spellbound in silence afterwards. May your holy season be full of tasty treats and sublime sounds! 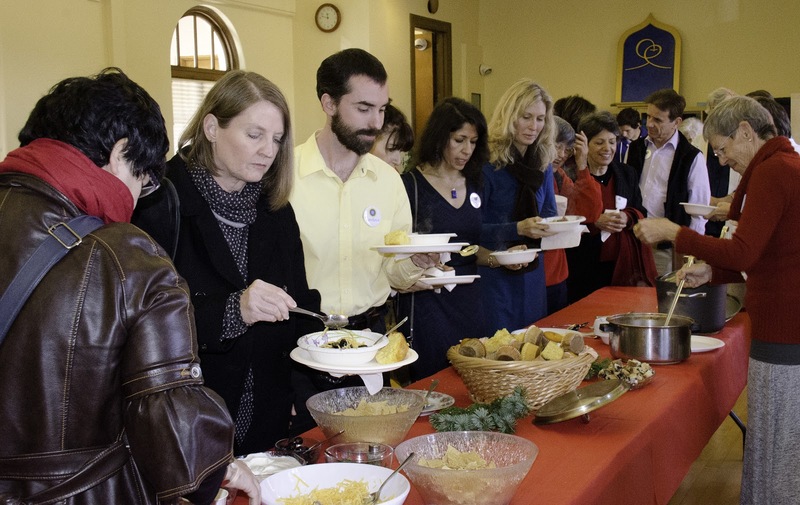 Our Christmas Concert last weekend was deliciously prefaced by our traditional Christmas Concert Lunch of vegetarian chili and cornbread, which is a great way to warm up on a winter afternoon. And if you want to relive the entire concert (or experience it for the first time, if you missed it) you can download the entire thing as an mp3 (59MB). Your news this week comes to you in several bite-sized tidbits. Think of these as appetizers preceding the multi-course gourmet meal of events (and Family News posts) that is a standard Ananda December. 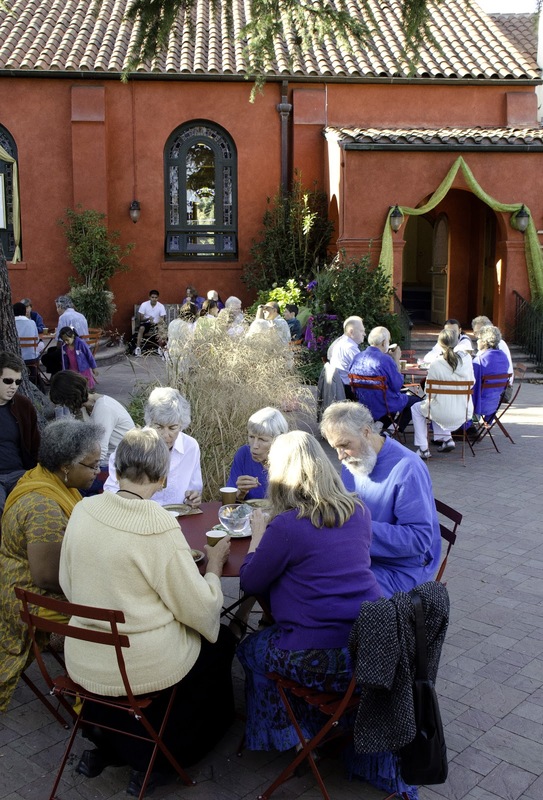 Our beloved Ramani has just recently left Palo Alto to serve in Ananda L.A. Ramani was a huge force behind the gardens and the CSA program here, started a weekly healing prayer group, and has been a very dear friend to many of us. 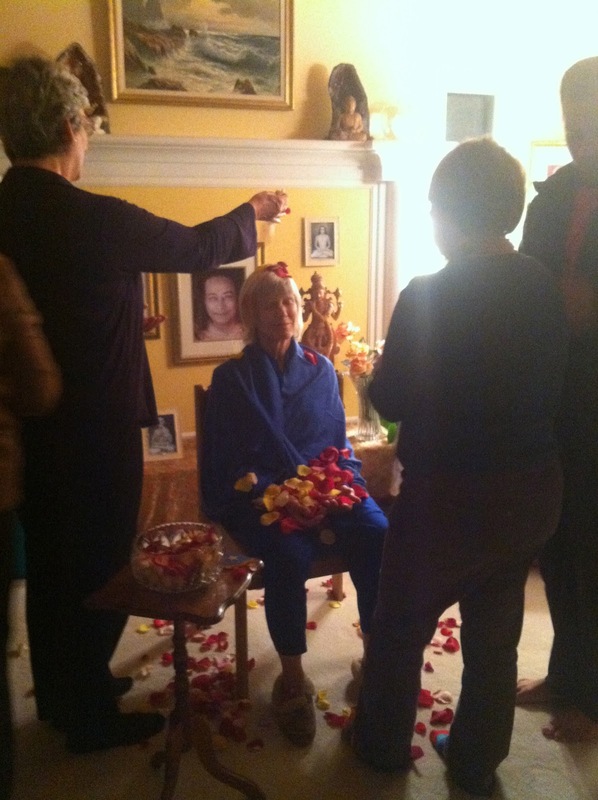 Before she left, we held a lovely “Go With Love” blessing ceremony for her, showering her with rose petals and good wishes for the next adventure. 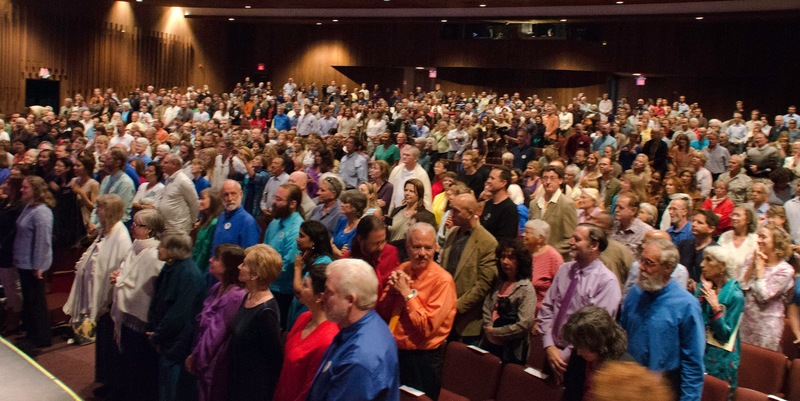 If you were at Sunday Service this past weekend, you probably noticed a few conspicuous visitors. 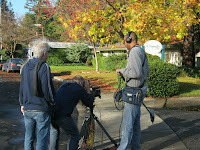 The movie being made about Ananda (working title: Cities of Light) wanted some shots from the Palo Alto community, and so they spent the day with us, both at church and at the community afterwards (when the sun miraculously came out just before we had to cancel most of the outside plans). 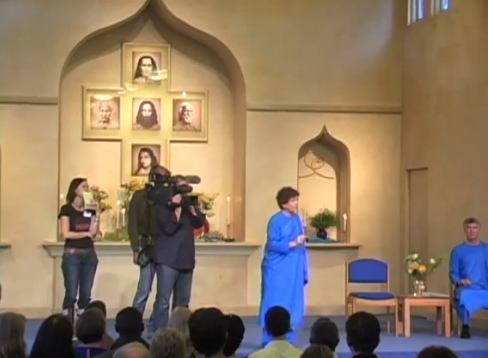 Left: The film crew sneaks up on Asha during her sermon. Right: They appear to be filming a bush, but someone’s about to walk out from stage left, honestly. 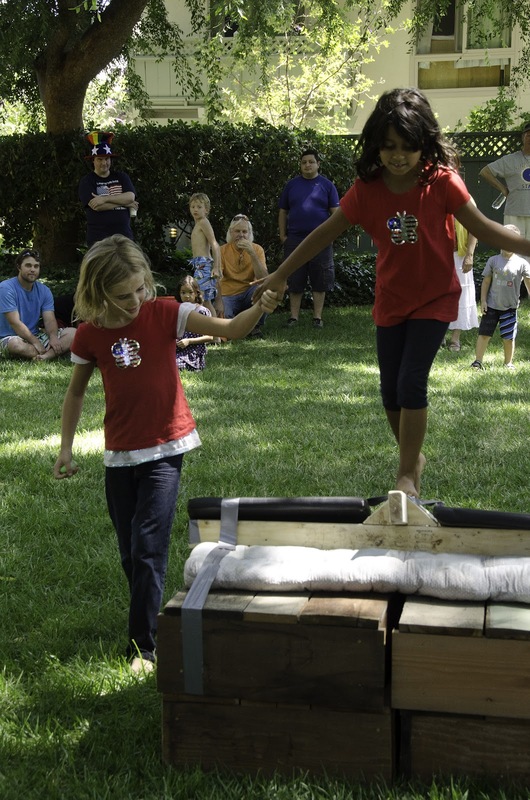 Sunday was also the date of our annual Ananda Crafts Fair. We had over a dozen artists offering a wide variety of beautiful handmade items ranging from wood worked altar items, elegant hand blown egg ornaments, music, artwork, devotional greeting cards, jewelry, herbal healing products, environmental friendly produce bags, mushroom kits, specialty preserved items, lovely scarfs, and more. Apparently no photographers, though, since I haven’t been able to get a hold of any photos. 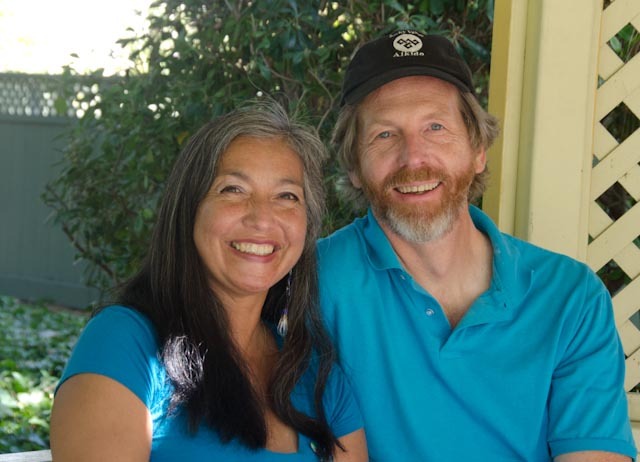 And last but not least, advance notice for all you plan-ahead types: Nirmoha and Rosalva’s wedding will be the morning of June 8, 2013 at the Ananda Temple in Palo Alto. 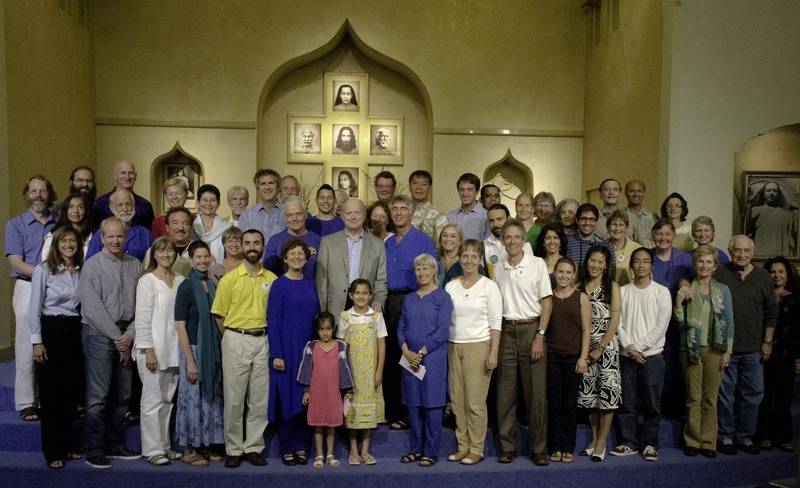 All Ananda people are welcome, so save the date! Following the ceremony there will be a potluck wedding reception at the community around noon. 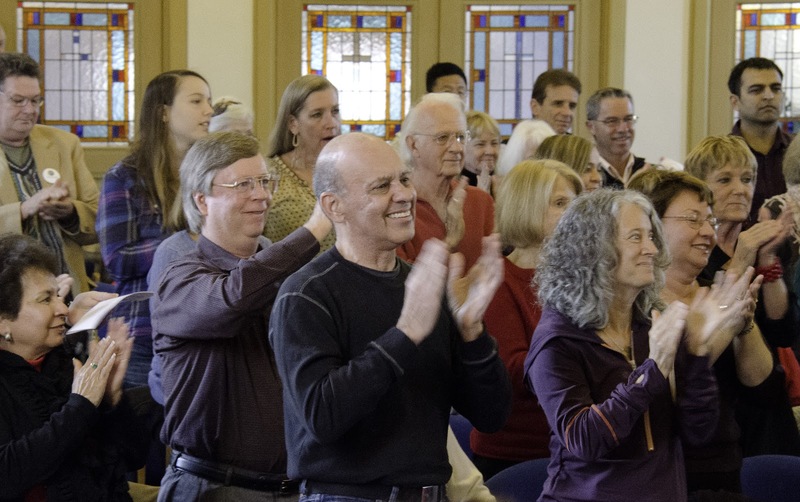 Not to leave the Gilbert & Sullivan contingent unchallenged, Team Barbershop also turned out a couple gems, also with videos: Ananda is Home, and Goodnight Yogis (which doubled as this year’s cleanup song, inspiring another round of cheerful karma yoga). 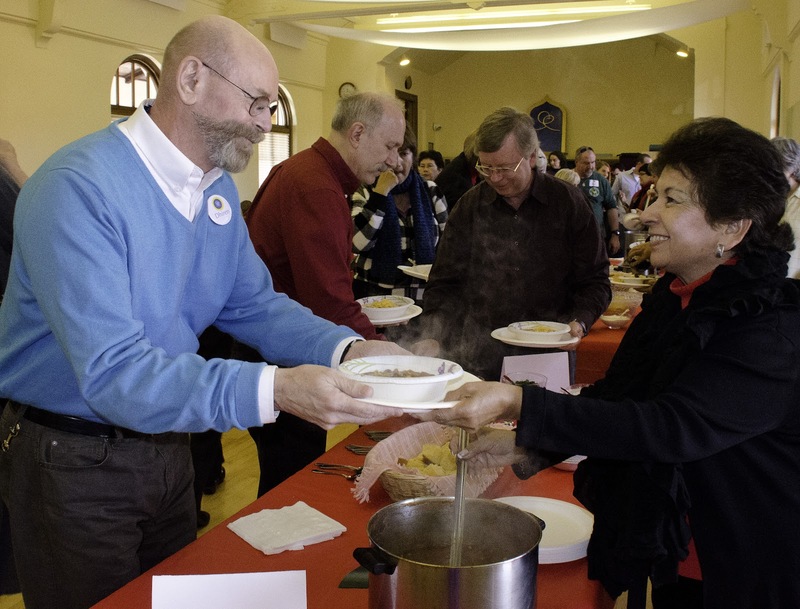 Happy Thanksgiving to all, and may we continue to give thanks for food, friends, and fun year-round! The “non-Swamiji” items weren’t too shabby, either. 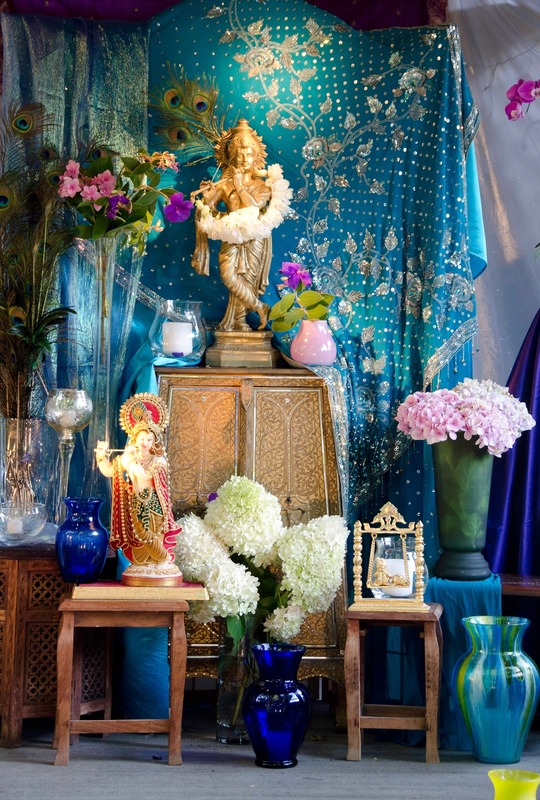 We had two of Jyotish’s paintings, a beautiful wooden altar by Sahadev, a “Shanti” sign from one of the original cabins at the meditation retreat (you can guess who won that), and a spineless Burbank cactus, a strain developed by the “American saint” that Autobiography of a Yogi is dedicated to. 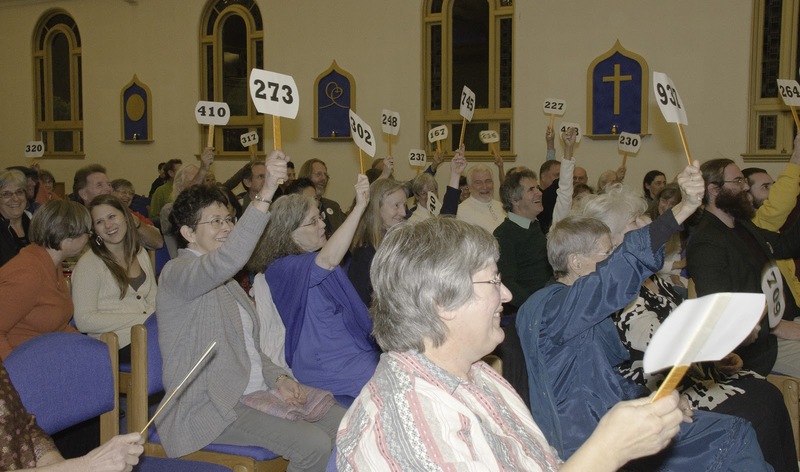 There was no silent auction component this year, so everyone got to engage in the bidding for each item, whether as participant or observer. 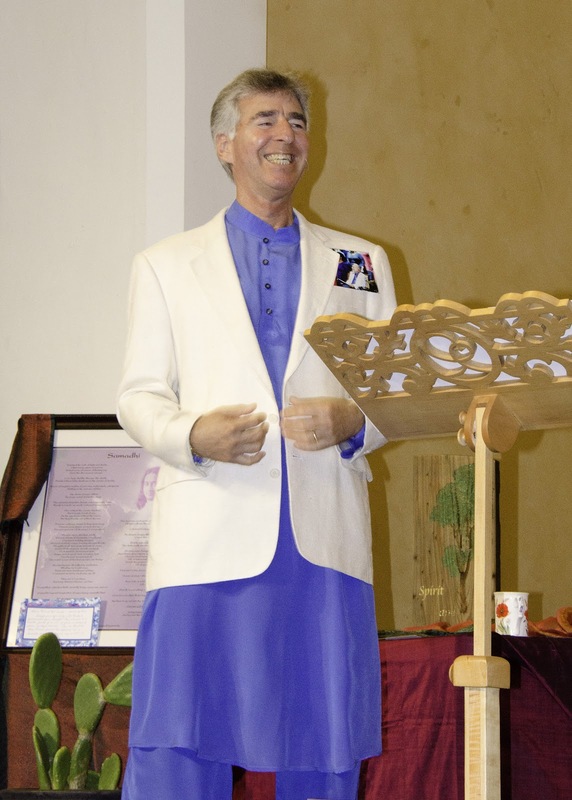 It turns out that an auction is just as amusing as everything else we do around Ananda, especially with David and Dambara MC-ing and obligingly modeling various items of clothing and jewelry for us. A tricky thing, though, about bidding amongst a group of people who are all so nice and fond of each other, is that items sometimes don’t sell for as much as they ought to. But the problem of having cruelly out-bid one’s friend is easily remedied by the winner promptly turning over the prize to his runner-up. 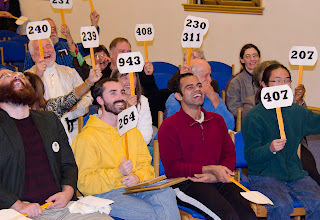 The auction wrapped up with a unique Ananda tradition, one that would only work in a crowd of yogis and renunciates: bidding on absolutely nothing at all. For a flat rate of $25, you would be generously allowed not to acquire any new possessions, while still being able to contribute to the Free & Clear effort. A remarkable number of people were delighted by this option, regardless of whether they had already purchased anything else. The spiritual path may not always be a walk in the park—the Mahabharata reminds us that it can be an outright battlefield at times. But once a battle is over, there’s nothing to stop us from having a good tea party to celebrate it all. 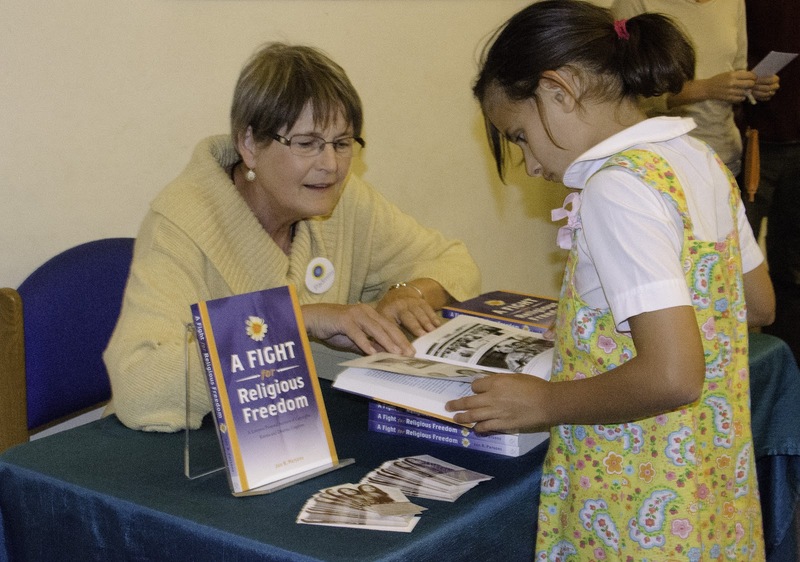 From 1990 to 2002, Ananda was engaged in a grueling legal struggle, defending our very right to exist. We succeeded, but that final year marked only the end of our time in court. For the past ten years we’ve been paying off the millions of dollars of debt the trials incurred. This year marks the final push to eliminate that debt, and with just over $100k to go, it looks like we’re on track to make it. (Want to help? Here’s where the magic happens.) 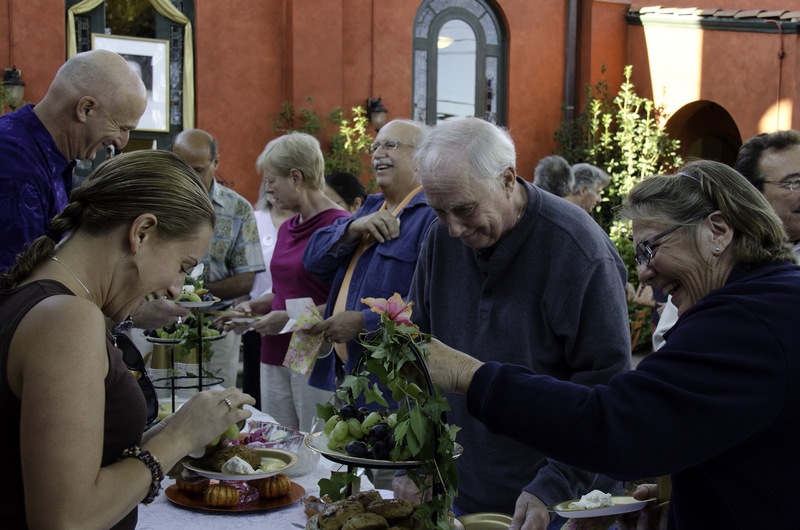 Saturday afternoon’s tea party in the piazza — complete with chai, scones, lemon curd, and Devonshire cream — was part of a fundraiser to help bump us the rest of the way over that finish line. Some of us there that evening had been part of this epic from the beginning. Many of us only came on the scene after it was long over. 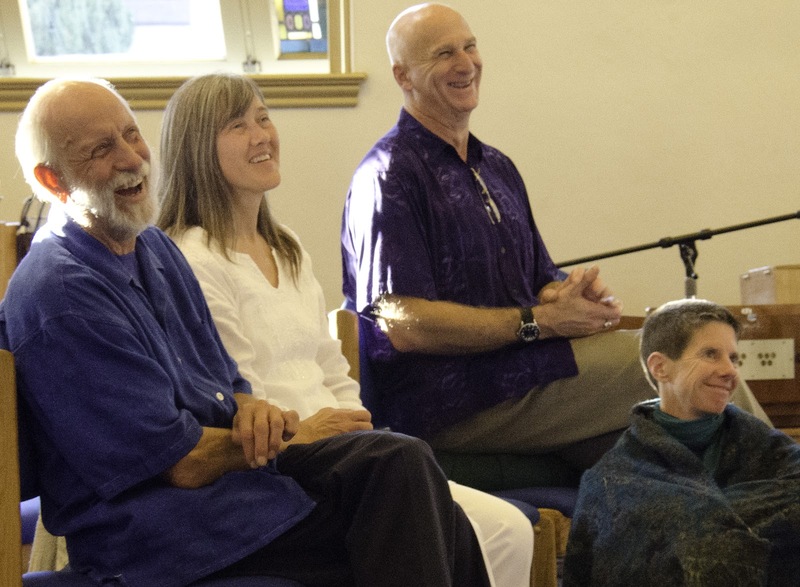 But one thing that Jon helps make very clear is that this experience was extremely influential in Ananda’s growth to be the dynamic spiritual community it is today, and that is something for which we can all feel deep gratitude. Jon Parsons and his fan club. 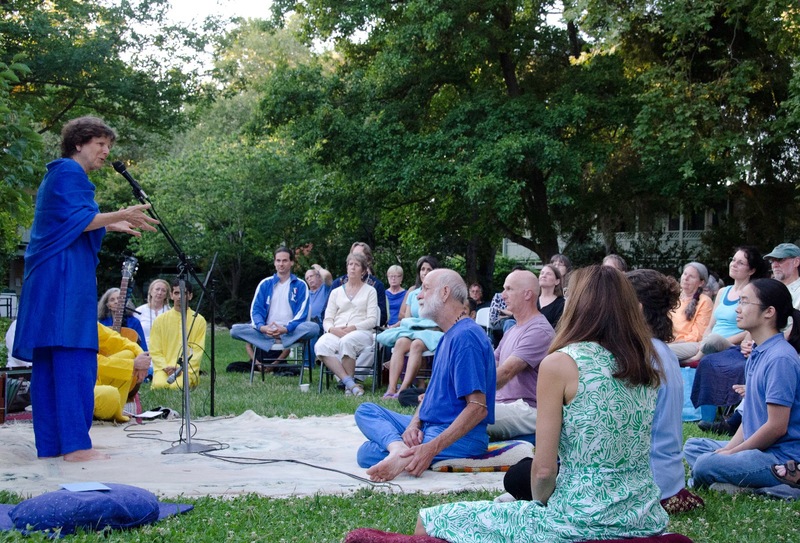 Swami Kriyananda finished his stay in the U.S. this year with a West Coast tour, and a final week here with us in Palo Alto. His health has been excellent (relatively speaking), and he’s so full of energy that it felt like our whole extended community was buzzing with it all week. Also during the week, Swami paid visits to both East West (pictured here with some of the staff) and Living Wisdom School. At the school, all the children made him cards and presented them to him in a large bundle. Instead of simply taking them home to read later, he read each one individually, thanked each child personally, and commented on what their cards and artwork showed about their character. One young boy with strong, bold colors on his card was pronounced “very decisive; he’ll always know what he wants in life,” and so on. Sixty children were held spellbound and attentive just by his magnetism and love. Photos of the two visits are here. 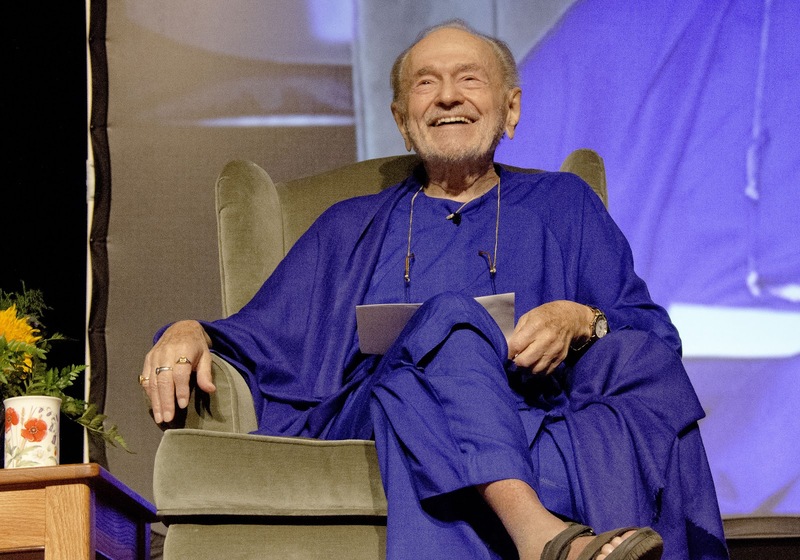 And so, after an incredible week all-around, Swami Kriyananda has headed back to India (via Paris and Dubai), leaving us with plenty of inspiration to keep us running till the next time. 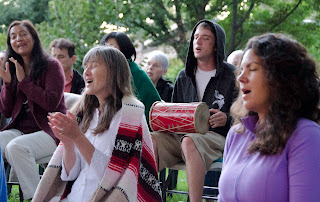 Krishna Janmashtami — Krishna’s birthday — fell on Friday, August 10 this year, and so we celebrated by moving our regular Friday kirtan to the courtyard of the residential community and having a beautifully expanded, Krishna-themed evening of chanting. 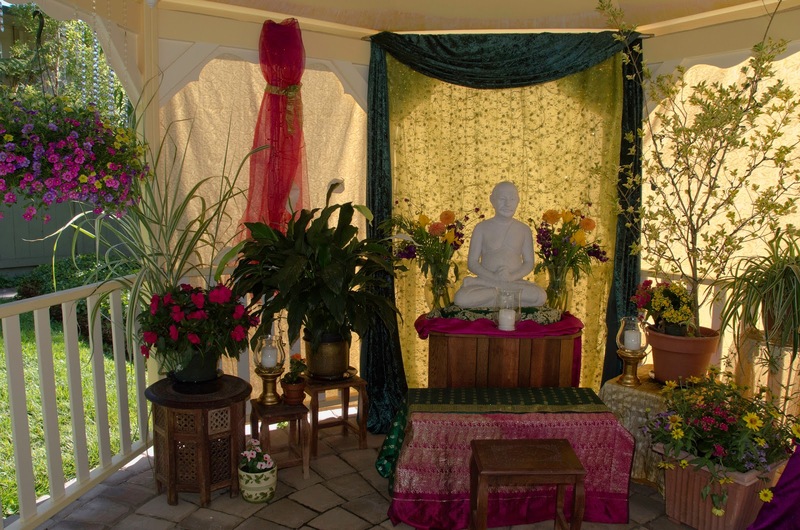 Yogananda kindly donated his gazebo, which numerous devotees decorated and filled with statues and images of Krishna. We spread out rugs and folding chairs on the lawn for the joyful crowd of souls chanting the sun down into the cool August night. No recordings, unfortunately (and how do you record bliss anyway?) but there are some lovely photos here. 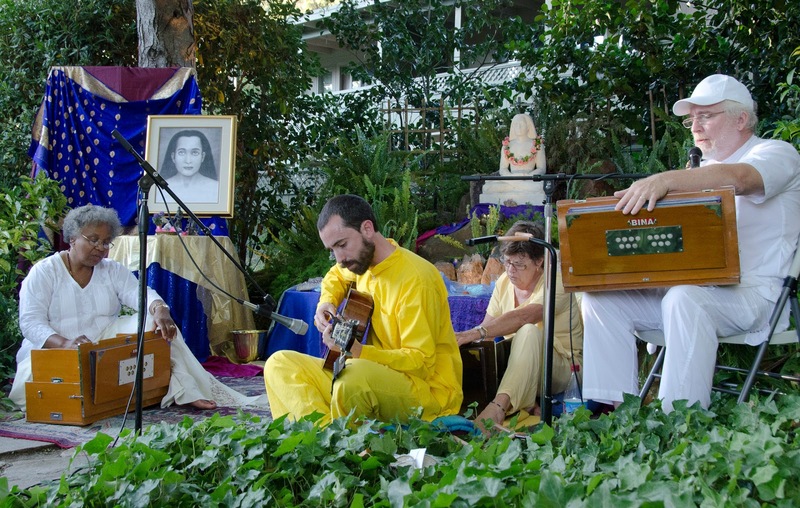 This Saturday evening we held our annual Guru Day celebration (photos here). 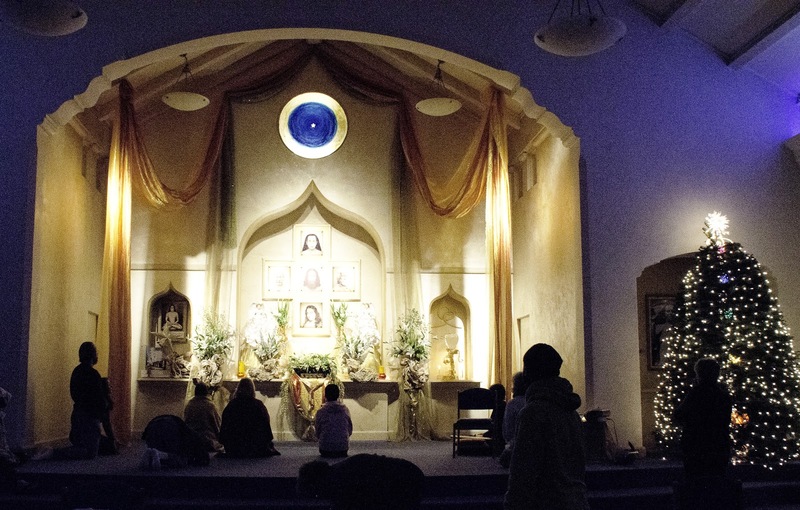 This is always one of the highlights of the year, a time of deep, personal communion with each master in our spiritual lineage. 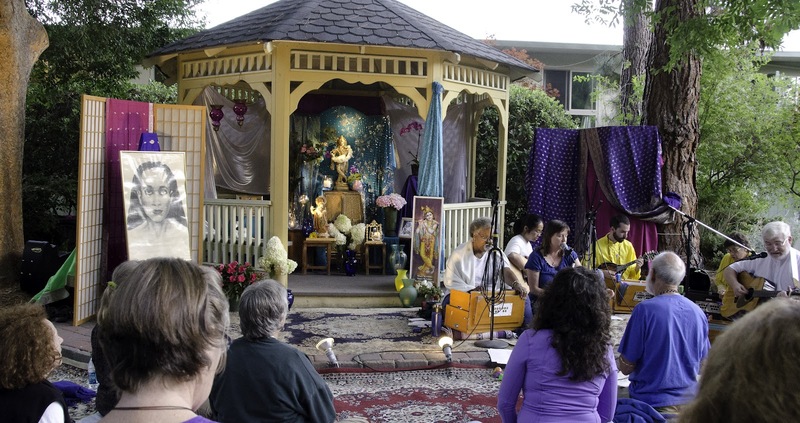 Each shrine in the courtyard of our residential community is gloriously decorated by loving devotees, Asha leads the pilgrimage from each one to the next, and as night gradually falls, the devotion only grows brighter. 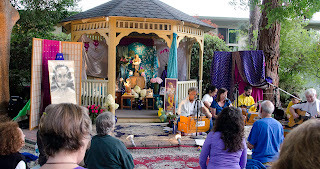 Sharing and chanting in front of the Lahiri and Babaji shrines. The theme for the evening was set at the first shrine, with Jesus: “To all who received Him, to them gave He the power to become the sons of God.” It doesn’t matter who we are; our job is simply to be receptive, realizing that God and the masters want to come into our lives every bit as much as we want to have them there. And to that end, it’s worth remembering not only their greatness, power, and glory, but also the ways in which they are so completely personal, loving, and accessible to each one of us. Babaji, the deathless master with his many miracles, seems to stand out in Autobiography of a Yogi as the epitome of an inaccessible Himalayan master and miracle worker. But think of the example we’re given there of how he cares for his disciple. He watches over Lahiri between lifetimes, and for the first decades of his life, until the time finally comes to draw him back to his guru. And then Babaji carefully orchestrates all the job transfers and chance hiking trips until Lahiri is standing before him once more, remembering, and seeing how his master had so lovingly preserved his meditation cave, his bowl and blanket, for just that moment of his return. 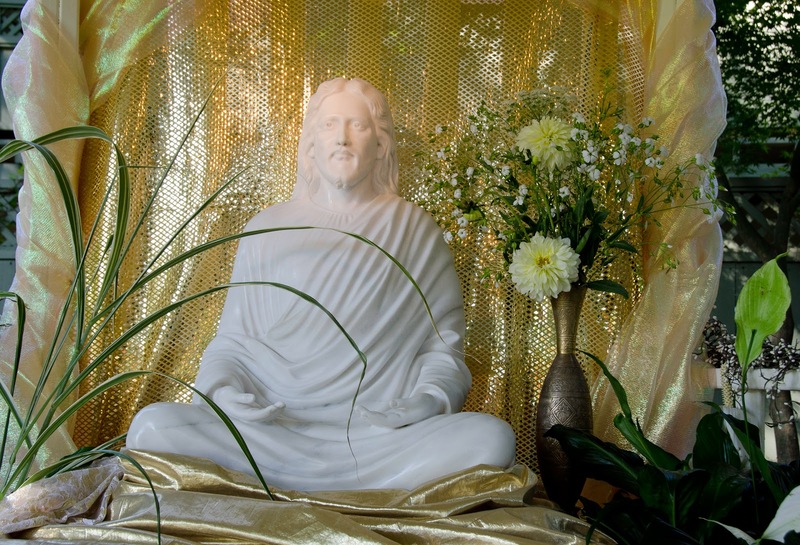 Lahiri Mahasaya, in his turn, kept his unassuming job as a government accountant all his life, even while training disciples and while quietly working out his wife’s karma to the point that she was able to perceive him in his true glory, with angels and devas bowing down to him. Another woman disciple of his was once late to catch the train to see him, and desperately, inwardly called out to him that she couldn’t bear to wait even a few more hours. When she reached the train, she found it held in place, wheels spinning, engineers baffled, until she boarded and it began to move. When she arrived, Lahiri teased her playfully about her impatience over such a little thing but still, he had been listening, and he did hold the train for her. 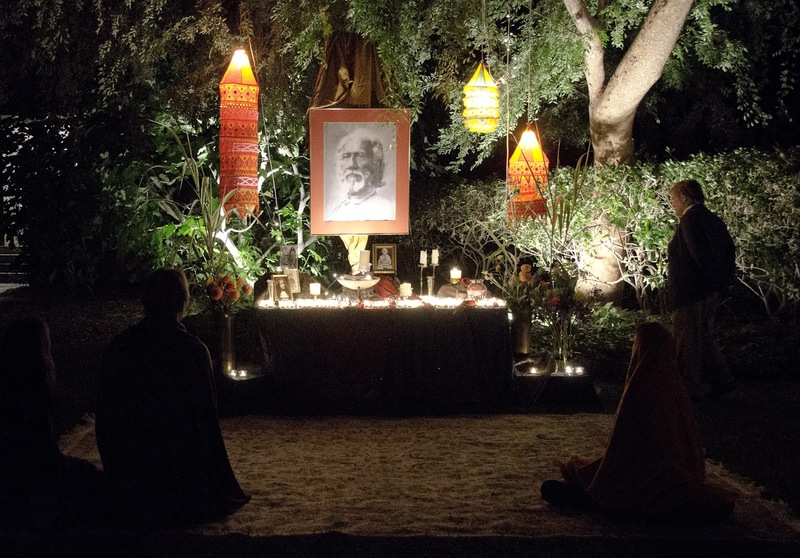 Swami Sri Yukteswar’s stern visage in the photos we have of him reminds us of his strict training and his attitude that his tiger mat was kingdom enough for him, separate from a “vast world interested only in externals.” After looking at his picture that way, however, we would do well to reread Richard Wright’s description of him in the Autobiography, and revel in his “jovial and rollicking laugh which comes from deep in his chest, causing him to shake and quiver throughout his body—very cheerful and sincere.” And of all the gifts that Yogananda brought back to him on his return visit to India, do you remember which was his favorite? It was the umbrella, because Yukteswar knew his little chela had originally bought it for himself, but decided to give it to his guru instead, and that touched his heart. 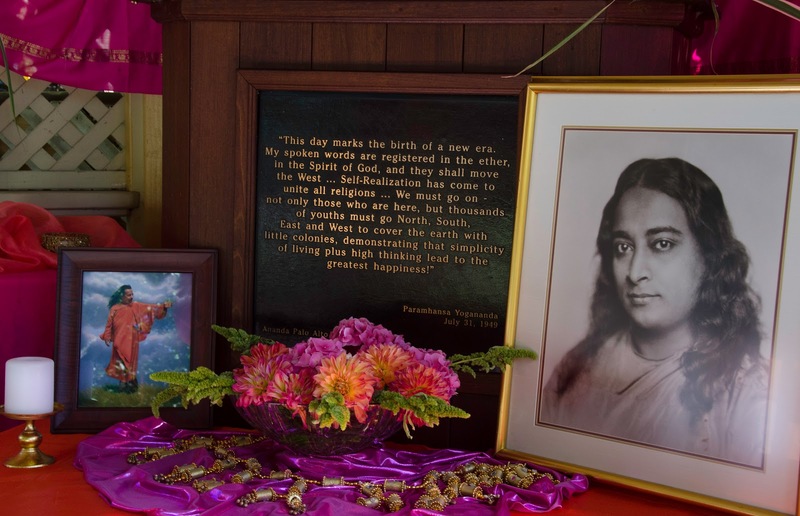 And then we come to Paramhansa Yogananda, our own beloved gurudeva, who promised us that he would bring us to God, coming back again and again, “crossing a million crags of suffering, with bleeding feet... if need be, a trillion times,” as long as any one of us remains in need. That is a promise for which we are grateful to him every day of our lives. 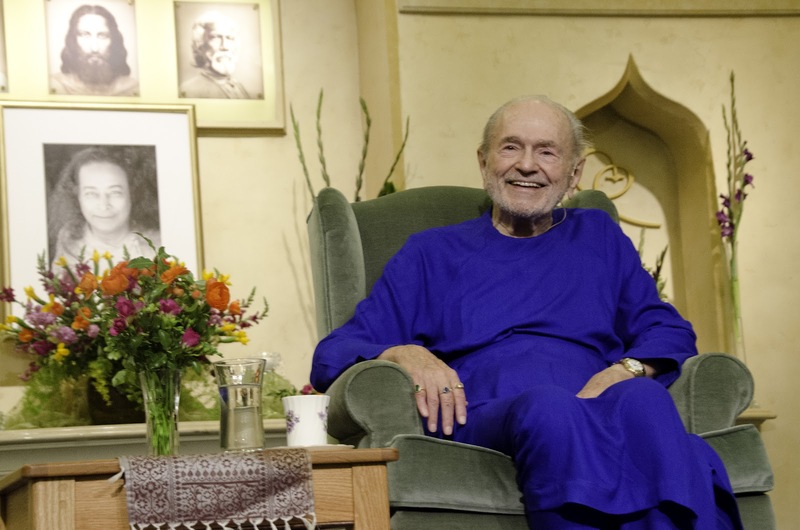 And yet Swami Kriyananda has also said that Master could be completely and utterly — apparently he could only use the word — cute. 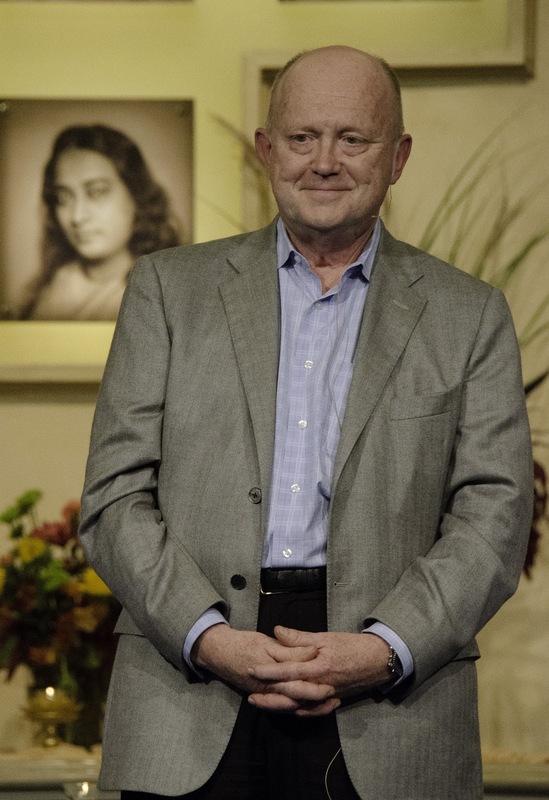 He was adorable, Swamiji says, absolutely charming, and able to relate to anyone and make them feel that they had a friend in him. That is the Master we can carry with us in our hearts, even as he does his work as “God’s boatman” behind the scenes. 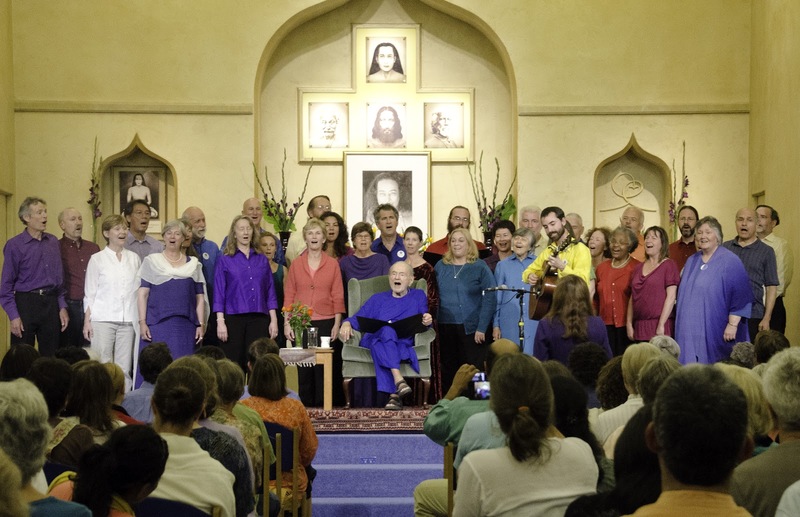 The evening concluded with a rendition of “O Master” from all the assembled hearts and voices, shining on both the vast and the personal in our relationship with our gurus. The truth that makes us ever free. O Master, may Thy joy fill our days. O Master, may Thy wisdom guide our ways. 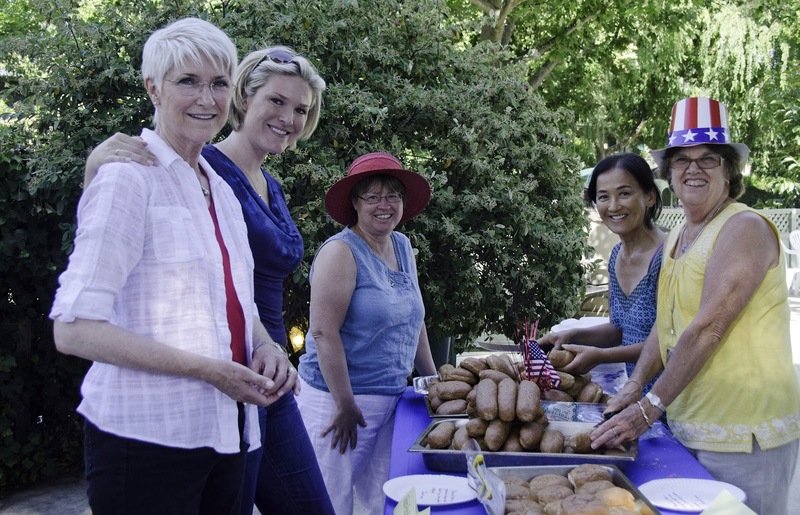 July 4th this year was a shining example of the joy of community living, as our huge Ananda spiritual family gathered at the Mountain View residential community for a delightful day of celebration. 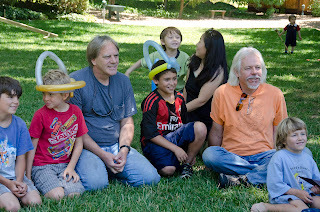 Balloon hats and magic tricks. And goodness knows how many more. The music (of course there was music) included a touching barbershop rendition of God Bless America and moved on to a 50-kazoo, mass-singalong version of Stars and Stripes Forever. 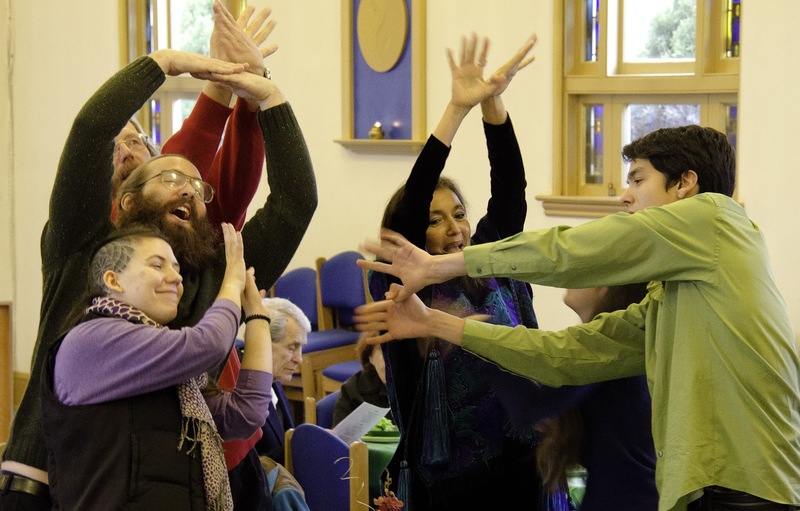 Rita also led a simple dance for everyone to participate in. 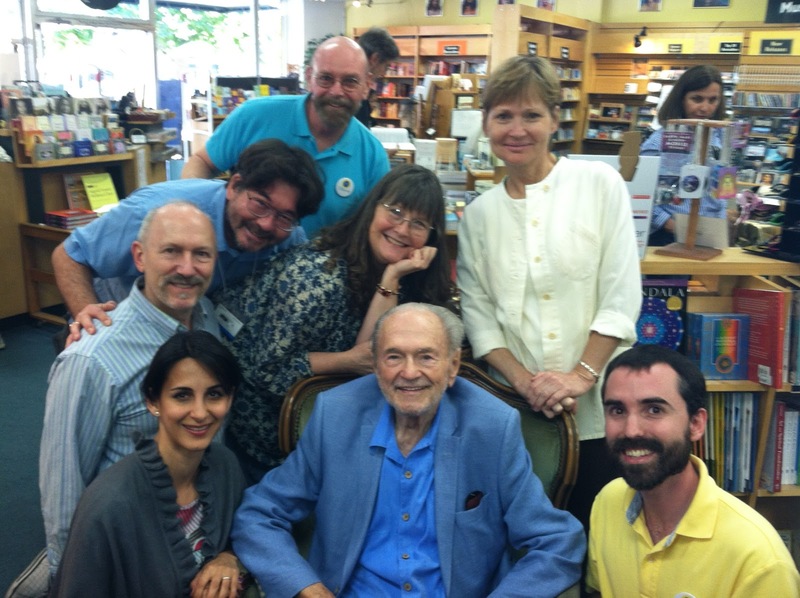 And so, in one way or a hundred, everybody had a marvelously fun time. The photo album just glows with the delight of it all.